In this week’s newsletter we sign off our January focus on volunteering, Ally Robb brings us her thoughts on remembering that we’re part of a wider community, Reading parkrun is back (kind of) and I help Rosie with her maths homework. Right then, I can put it off no longer, it’s time to address the most controversial, divisive and perhaps topical issue within parkrun today... volunteer recognition and reward. People’s views on this range from being that we should remove volunteer points entirely, remove volunteer counts and not recognise volunteering in any way, through to equal points, counts towards the club t-shirts and individual volunteer counts being presented prominently on the parkrun website. This is something that we at parkrun HQ discuss on a weekly basis, and whereas I’m confident the thoughts presented over the last three weeks are where we should be, when it comes to volunteer recognition it’s still not entirely clear in my head. So the discussion below is simply an open book as to where we are today, it could change. This is also a subject that I consider most days and several times a week I end up engaged in a reasonable debate on. I don’t yet know the definitive answer, but I do know that I understand the question very well indeed. As recently as last autumn I sat down with our friends at adidas and we looked at the possibility of giving every volunteer this winter a parkrun hat and gloves. Not a reward for their volunteering, simply something we thought it would be good to do and would recognise the fact they were stood out in the cold. Working through things a little further we realised we would have to produce and distribute 20,000 of these winter warmer sets, and that wouldn't include any new volunteers who signed up after that point. Even when we reduced the number down to people who’d volunteered at least five times it was still something like 5,000 people, and what about the people who’d volunteered four times when we drew the line, only to do number five that Saturday? What about people who’d volunteered five times 12 months ago and then never come back? With 160 events stretched right across the UK and average attendances from 8 to 800 who was going to make up the 160 vastly different packages and stick them in the post? Once they arrived at a specific event who was going to then distribute the items within the local parkrun community? You can see that once we do the maths it’s not what you would call straightforward. I’d like to clarify the difference between recognition and reward, a subtle but crucial point. It’s extremely important to recognise an individual’s achievements. As the father of a one year old girl I receive a daily reminder of the smiles that an enthusiastic ‘well done’ can produce. I’m sure that recognition of our actions is something we all need, takes nothing to do and improves our feeling of self-worth. Reward however moves our focus to the outcome rather than the process and actually works to change our fundamental reasons for doing what we do. When Rosie finally has maths homework I’d much rather teach her to enjoy maths than pay her a fiver to get the job done. We only have to look at the recent examples from the World of cycling to see what happens when the reward becomes the focus. One suggestion that regularly comes to us is that there should be a table somewhere that displays everyone’s volunteer tally. Unfortunately we have learnt by experience that this becomes divisive as people with a low volunteer count are looked down upon and a vocal minority with a high count become somewhat self righteous. The only way something like this can increase volunteering is through negative emotions and feelings. It is therefore absolutely our belief that volunteering should be done simply for the pleasure of doing it, not because you think you will receive some kind of material reward. If you’d allow me to go off on a slight tangent for a moment I do find it increasingly frustrating that everything we do in life should be encouraged through material means, it’s a shame that we are more likely to give up smoking because it costs more money rather than because it costs more life, or that (some) athletes put earnings over championships, or even from my experience in academia, that we tell the next generation to choose their degree course based on potential income. What happened to living healthily because it’s healthier, striving to be the best athlete you can be rather than the richest and making your degree choices based on a future doing something you love? I firmly believe that we should engage in volunteering because it is something we would love to spend time doing, and not because we will receive material goods in return. That doesn’t mean I don’t think volunteers should be recognised, they’re changing people’s lives every day through their amazing actions. Let us consider who volunteers are really volunteering for? If we were a for profit organisation making money for our shareholders or preparing to sell out to the highest bidder as soon as we hit a million members then there’s no doubt the volunteers would be working for us. However, as a not for profit with the simple mission statement ‘For there to be a parkrun everywhere in the World that someone would like one’ the relationship is the other way round, parkrun is effectively working for its volunteers. When I was involved in establishing Leeds parkrun in 2007 it was us that owed thanks to parkrun, not the other way round. We wanted a free run in our community and they helped us do it. Whenever I take part in one of our events I try to thank as many volunteers as possible, I’m not thanking them on behalf of parkrun I’m thanking them as someone who is grateful for their efforts in giving me a fantastic Saturday morning. My Dad has recently moved to Johannesburg and I am extremely grateful to the volunteers at Delta parkrun for giving him an instant friendship group who are supportive of his healthy lifestyle choices. Following those lines of thought then it seems that parkrun volunteering should be recognised in a non material way by the local community as opposed to rewarded in a material way by parkrun HQ. A great example I’ve seen of this is one of our events that hosts a volunteer party each year where they use money from their donations pot to fund food and drink round someone’s house for everyone who has volunteered five times (or more) that year. Unless you leave the party with the telly I personally don’t see that as a material reward. There’s no doubt that volunteering has become a fundamental part of what we do, around 10% of active parkrunners volunteer and the vast majority of those are having an amazing time doing amazing things. They are contributing to the greater good of a healthier society, building communities, bringing friends and families closer together, creating true quality time in a World where that is lacking and building toward a greater good for altruistic reasons. Surely that is reward enough? To go back to my first newsletter of the year, I declared 2013 would be ‘the year of the volunteer’ and using the concepts presented over the last four weeks as a foundation I believe we will increase the number and diversity of volunteers across all of our events. More importantly we will change the culture of volunteering across our communities empowering many more people to experience the wonderful benefits associated with doing something good, for good reasons. We are currently working on a number of exciting projects to achieve all of this and in the final newsletter of each month I’ll be bringing you an update on where we are and what’s happening. Thanks to all the volunteers out there on behalf of parkrunner A6013 for giving me, my friends (old and new) and my family (old and new) 54 wonderful parkrundays every year. P.S. I do intend to reply personally to everyone who has written to me about my recent newsletter articles, this will take some time however so you’ll need to bear with me. - Reading parkrun is temporarily moving to Dinton Pastures Country Park from the 2nd of February until further notice (see the course page for more details). I've been volunteering at my local parkrun most weeks for several months and enjoy doing so despite the cold and wet conditions. At my parkrun during the run brief the Run Director includes an invitation for the runners to thank the volunteers, always resulting in enthusiastic applause. Also, whether I’m at the finish handing out tokens or scanning barcodes many runners make an effort to thank us and this is enough for me. I was awarded the Sweatshop Monthly Prize for January which I didn't know existed and which of course resulted in a certificate for a free pair of shoes. I realised that Sweatshop gives this certificate every month for every parkrun UK location and therefore Sweatshop is putting a lot of money into parkrun, so thanks to them. Even if I had been aware that this prize existed it would not have affected my volunteering rate. I have read all three of Tom's recent articles and found them all quite fascinating. I'd like to add that not only is volunteering a great experience but when or if you as a runner have the unfortunate experience of being injured, then volunteering can keep you in the loop as part of the running community. When I was out through surgery it really was a godsend. So what I think is that parkrun should always have plenty of volunteers as there are always, unfortunately, plenty of injured runners. Putting that aside, I always have great pleasure volunteering and surely being part of your local parkrun team is all that it is about! Just a quick note to say that I received my first newsletter today after signing up in anticipation of the new Cheltenham parkrun. I read the piece about volunteers, checked my diary and messaged the organisers with Saturday dates prior to Sunday races when I won't be running but would be happy to lend a hand. Thanks for the gentle nudge in the right direction and thanks in advance to all the Cheltenham volunteers who will make the event happen on the 16th February! I've just read your newsletter and felt compelled to write. I started running at Banstead Woods parkrun two years ago and after a while began to volunteer. I was made welcome and felt valued immediately, even though I'm pretty sure I made a mistake during registration duty. This was completely dismissed and I was assured there had been no problem at all. Since Riddlesdown parkrun opened I share my time there and at Banstead and also regularly volunteer there. This event has many regular volunteers, many youngsters who never run but always turn up with a smile on their face. Due to the snow this weekend, Banstead Woods was cancelled so I went to watch friends run on Roundshaw Downs. They only had one marshal in terrible conditions and so I volunteered to marshal a tricky corner. The moral of the story is I've met loads of people, it's nice to cheer people on (and be cheered on) and it adds to the community feel that parkrun offers. I thought that you dealt with the issue of ‘volunteering/not volunteering’ brilliantly well in your last newsletter. I run regularly with my daughter because I know the benefits of staying healthy and want my children to share in that and that is where parkrun is brilliant as it's accessible and an easy way to stay active. Of course, with this freedom and privilege comes a shared responsibility and having become ‘stakeholders’ of sorts in the venture we hope to have the opportunity to contribute in the very near future by volunteering on a regular basis. Saturday was my fifth parkrun and as always I was the last to finish, however I'm getting better all the time and it’s a great feeling running in at the end being clapped by all the volunteers. I would also like to thank Kevin, Trevor and Cass at the Brighton parkrun who alway complete the last lap with me, giving me encouragement and that hidden bit of extra stamina to get to the end. Thank you Brighton parkrun for getting a 65 year old up and running again, my next aim is a new PB. I write to express a personal perspective on volunteering. I run at the Ipswich parkrun and haven't missed one since the start. I love running, run for a club (Felixstowe Road Runners) and race outside of parkrun as much as I can. I've found parkrun to be a very useful "effort" session on a Saturday morning. But there's so much more to it than that. I've made loads of new friends, enjoyed shared experiences (Christmas Day parkrunning was a highlight) and even brought new runners into the fold. I was aware that I had a zero in my volunteering column, and, whilst not actively wanting to give up a run, I felt a sense of duty and that I should give something back. I was given the role of timer on my chosen volunteering day. I loved it! It gave me a totally new perspective on the event and I made even more new friends. I felt like I was contributing to the success of the run. I will certainly be delighted to volunteer again and I would recommend it to anyone as it gives you a more rounded picture of how it all works. It's worth mentioning that Ipswich doesn't struggle for volunteers and I didn't “need” to do it, but I'm really glad I did. I ran my first ever parkrun on the 26th of January Medina, Isle Of Wight and had a wonderful run. The conditions underfoot were extremely muddy and it was the first time I had run on mixed surfaces. I ran a creditable time but more than that I was made to feel quite at home even though I was a ‘tourist’. I am now looking forward to the first parkrun in Telford where I currently live. Thanks parkrun for an excellent set up. I would just like to add to the articles on volunteering. I was very nervous my first time and went through exactly where I needed to be as a marshal as I had only run the course a couple of times and am useless with directions anyway. I was asked to go to the bottom of 'cheeky hill' at Conkers parkrun, which is just over a mile from the start and asked to take the directional arrow to the top of said hill. Off I set and part way along I started to panic I would not get there before the first runner, so off I set panic jogging in walking boots, big coat and high viz jacket! Needless to say I got there in plenty of time. I clapped everyone past and although I am not a fast or experienced runner I found it great to watch the lead runners and their running techniques. Watching the youngsters go past was a delight, some were determined, some were smiling and some were playing games as they ran to take their mind off their aching legs. If you are yet to have volunteered, have a go and enjoy watching them as they are an absolute joy. I marshaled for the first time at Bushy parkrun on Saturday the 19th of January. Despite being a bit uncertain at first about what was expected of me I soon settled down as the organisers were really friendly and explained what I had to do. I really enjoyed my stint on the last tree/corner, warning everyone to mind the tree roots and the compacting snow as they manoeuvred themselves into position for the final 200 metre straight. My husband was standing nearby with my border collie cross, who is coincidentally called Marshall, so there were two marshals manning the post! The runners were brilliant as they went past, a lot even saying thank you and hoping I was warm enough, and to think it was they who had had the bottle to do a 5k run early on a freezing January weekend morning! I like the running bit too but feel good about giving back as well. I am volunteering again this Saturday and really looking forward to it. I wholeheartedly recommend it! I’ve recently returned to running/jogging/fast-walking and have just completed my fourth event at Swindon parkrun and therefore four consecutive weeks of feeling very proud of myself. Someone at work had mentioned parkrun to me so I decided to give it a punt. Well, what can I say? An amazingly friendly atmosphere, a great mix of abilities and a simply fantastic way to start Saturday. I have been so impressed with the volunteers that I am determined to do my bit and say I'm one of them throughout this year. I must mention meeting an old friend from football of yesteryear who gallantly does the timing each week with his 11 week old baby snuggled up in the pram next to him! I have also bumped into other old friends who clearly love the parkrun ethos and it's quite inspiring to get out there with them. On Friday evening having confirmed that the parkrun would go ahead despite the six inches of snow, my mind was made up, run I shall! So, as per my new Saturday morning routine I left home on my bike at just gone 8:15am. It was precarious under wheel to say the least so I probably looked a sorry sight with my legs getting pinker and me getting up the first hill pretty slowly. Suddenly a vehicle pulled up alongside me, I looked to my right and there was a guy in a Land Rover who said "Are you off to parkrun mate? ", "Yep" I puffed back to which he replied "sling ya bike in the back then, you'd better get in". Now I'm not one to turn down an offer like that and this stranger duly took me to Lydiard Park, out of his way and even made sure he dropped me at the best park entrance for me. This just proved to me what one parkrunner will do for another. By the way he wasn't running that day. I am feeling a little guilty that other Swindon parkrunners thought I braved the snow on my bike to make it there! To my Land Rover Chauffeur, thank you so much. I have only run Bramhall parkrun six or seven times, the rest of the time I have had a great time getting caught up in the buzz leading up to and during the run itself by volunteering. When I talk with many of my fellow volunteers I am always told how much they enjoy the experience. Many volunteer again and again - once tried, often repeated! The fun of watching the run unfold, seeing a snake of runners wind around the route, cheering your parkrun pals and getting warm smiles in return! No wonder the fellow volunteers I speak with enjoy it so much! My home run is Hull parkrun and having seen a request for volunteers in the previous week I took the plunge and fulfilled this request as I was going to be there in some capacity anyway. I felt that the time was right. I just wanted to follow up on your newsletter to confirm what a wonderful experience it was. Now last Saturday, I don't know if you noticed but it was quite cold and in Hull half the course was in thick snow (while the other half was shallow snow). This made my first task of sign posting the course quite a workout in its own right. Once I got back to the start area I was introduced to some of the people who I had regularly seen but never spoken to. I was then informed that my second task of the day was to be timer. Following on from point three in last week’s newsletter article, I did have a brief crisis of confidence. Once it was set up and it was explained that I just had to stand and press a plunger all my fears were gone. As the event started and 128 people headed out into the snow I had a brief pang of envy, but truth be told, if I hadn't been volunteering I would have probably woken up, looked out the window, seen the snow and got back in bed. What followed was a chance to have a chat with the other volunteers. Now I hear a lot about the social side of parkrun but have never really had the opportunity to get involved. I usually turn up, complete the run then go straight home, where it is straight in the shower and either out to work or to parent my two young boys. I was amazed at how many of the other volunteers knew the names of the other runners. Now I am not saying that I am now in the loop but one morning of volunteering has given me the names of far many more other runners than I had got from completing 15 parkruns. Whilst I am still keen to get out and complete the run again, I will certainly be ensuring that I volunteer too. This is especially so as I feel that if it wasn't for parkrun that I would probably still be struggling to complete 5k on a regular basis. As it now stands I have completed a half marathon and I am considering a marathon later in the year. None of this would have been possible if it wasn't for this free weekly event! As a newbie to parkrun I am impressed with the content, approach and style of the newsletter. Volunteering is a delicate subject and I agree that despite it being such a positive concept it is bizarre that it can create negative emotions. I appreciate that as organisers you have to manage, address and encourage the issue. I've two runs under my belt and want to keep up my running before starting the volunteering, but I will. To make sure it happens I’ve added it to my 'to do' list. I’ve added as a comment to my list ‘Arrange to do one volunteer for every nine runs thereafter’ as your 10% struck a chord with me! I agree very much with your articles about volunteering. However, I know one of the Run Directors at Tilgate parkrun and he told me that they usually get more than enough volunteers (which is really good) and that they'd instead prefer a donation. So that's what I did, I donated online via the event’s results page and will do again sometime. So not all parkruns need volunteers, some can be contributed to in different ways! Number of runs: 42 and have only missed one Newbury parkrun since the start in either a running or volunteering capacity! Favourite volunteer role: Run Director. I love the sound of my own voice, welcoming new runners to the family and then once I say “Go!” everyone runs off and I get to see everything in action, chat to all the other volunteers and cheer all the runners back in. What do you do at parkruns: Apparently I talk too much on the pre-run briefing! I will always do as much as I can to help Rachael Elliott and the team out, even if I am running that week. I also use the post-run cafe visit to catch up with other members of my club and fellow parkrunners over the most amazing rock cakes! How has parkrun changed your running: I have made some really good friends since running parkrun plus the advice and support I’ve received has made me a smarter runner. Also Saturdays are no longer a lie in day! What do you like about parkrun: When I am volunteering I enjoy seeing all the runners looking happy and exhausted with their efforts. When running I like the feeling of utter pain when I know I have given it everything. 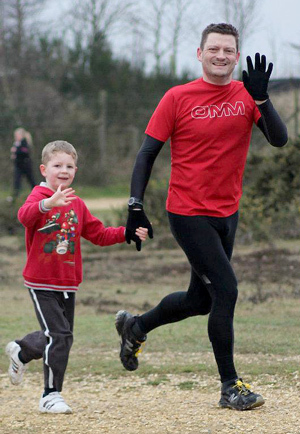 parkrun brings people together and turns them into friends. The fact that people have to do very little to run in a group of runners and gain experience in ‘race’ like conditions. Add to this the motivation slower runners get to improve their times when they see other people improving. Most memorable or funniest parkrun moment: There have been plenty and the list is long but from a personal achievement point of view I am still pretty happy with my Jubilee parkrun double. I cycled to Basingstoke and ran their parkrun then cycled all the way back to Newbury to run there. I made it by the skin of my teeth and then had a well deserved picnic up on the common! Coming into January with many people’s New Year’s resolutions to get fitter and healthier it means many parkruns are busier than ever. Therefore I think this is as good a time as any just to remind our community of runners about the value of each others personal space at parkrun. There have been rare occurrences of people not fulfilling the unwritten yet agreed upon rule as a communal runner to appreciate, value and share the space of others. As parkrun is not a race we can all agree that the understanding is that there is no urgency to encroach upon another runner physically for the sake of half a second. For some, it may be the case that at parkrun achieving faster and faster times is more important than anything else, including the wellness of others. Understandably we all love a PB, but this should never be at the expense of physically imposing oneself upon another parkrunner. Consideration comes from enjoying the event first as a friendly collective and then consequently appreciating the results after that. Of course I’d like to clarify that most of you reading this are considerate to others. Our community on the whole also considers parkrun, as a mass participation event, to mean that being in a public park requires understanding that we have no right of way over other park users. From running to volunteering, to fully experience the rewards of being part of such a large scale participatory event immersing yourself in the spirit of the event means focusing on the ethos in which parkrun is presented. This may require having to forgo a few extra metres on top of your 5,000 if it means preserving the personal space of others and not potentially making contact with another runner who may be “in your way”. We can all take part together safely and help put the event on together for the good of everyone involved. I have made great friendships through parkrun and feel ingrained within as part of this unique, burgeoning and participatory movement, which now spans across this country and internationally. The reward I get from participating with others in these events is priceless and I hope we can all work toward protecting this vision we all share and that’s to run (and volunteer) together as one. This entry was posted in Newsletter and tagged volunteering by admin. Bookmark the permalink.